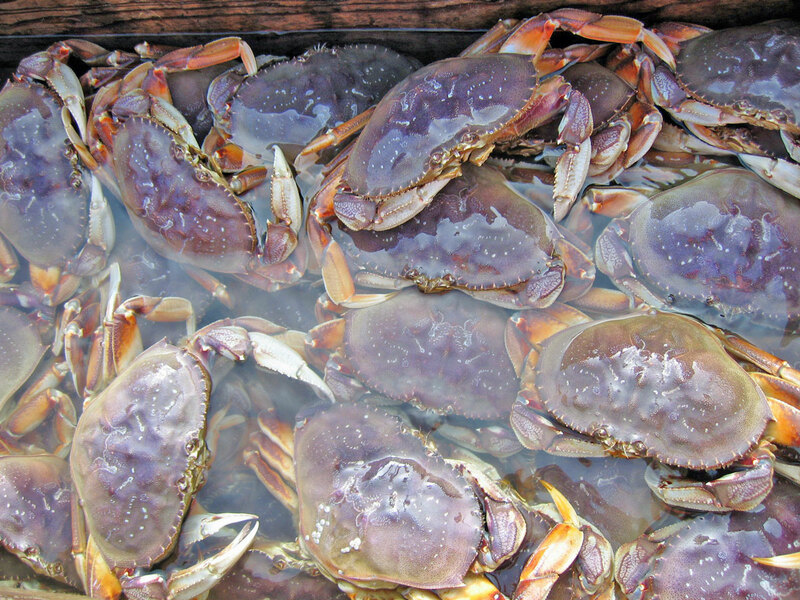 Dungeness crab are relatively short lived crustaceans. Maximum life expectency for Dungeness crab is about 10 years. 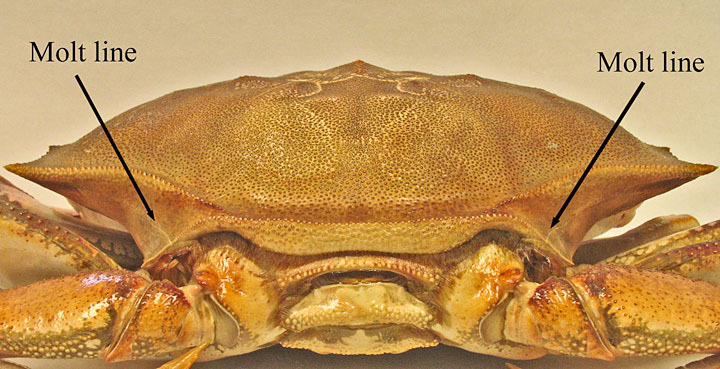 Most commercially caught Dungeness are 4 years old when they are between 6 ¼ and 7 inches wide across their carapace. Click on the image(s) to see a larger size. After hatching, Dungeness crab take on a larval form similar to many other crustaceans. 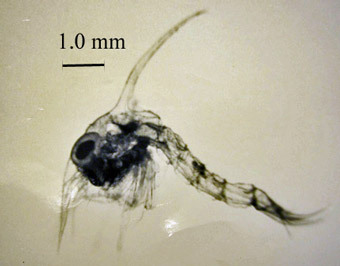 These microscopic "Zoea" live pelagically (suspended in the water) and are generally swept out to sea with currents, as they have very limited swimming abilities. The Zoeal period includes 5 stages and lasts from winter to spring. The "megalope" stage is characterized by a reduced tail and increased size. Dungeness megalopae, like zoea, continue to live pelagically. Reproduction events of adults have evolved to time the occurrence of this stage in the late spring. By this time, ocean currents tend to move towards shore where these young crabs can settle in nearshore areas. Dungeness crab megalope are an important prey item for vast numbers of larger animals such as coho salmon and grey whales. In late spring/ early summer, megalope can be seen throughout the nearshore areas of Oregon, sometimes in fantastic numbers. Megalopae can even be observed doing some ingenious hitch-hiking on a small purple jellyfish known as Velella velella (or “by the wind sailors). These jellyfish sail to Oregon’s beaches in spring months from offshore areas. The Megalopae stage occurs in the spring and summer. Juvenile Dungeness crab feed on a variety of small invertebrates, such as ascidians. 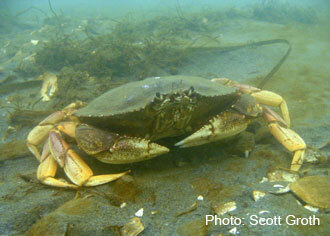 They usually avoid habitat overlap with adult crab, since they are known to cannibalize. As juveniles, they prefer shallow estuarine areas with protective structure such as pilings, woody debris, and eelgrass. Crabs remain juveniles for their first 2 years. 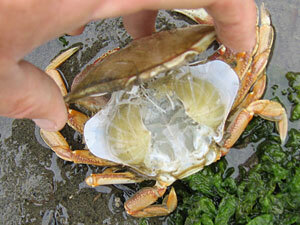 In their first 2 years Dungeness crab molt as many as 6 times a year! As they become mature (at age 3) this slows to about once a year. When preparing to molt, a crab’s old exoskeleton separates from the new one beneath. At this time the new exoskeleton absorbs water and become larger. This causes a split at their “molt line”, located mid laterally on the carapace. The new and extremely soft crab now has the flexibility to back out of its old shell. During this incredible feat, crabs are extremely vulnerable to predators and for that reason it’s done quickly. 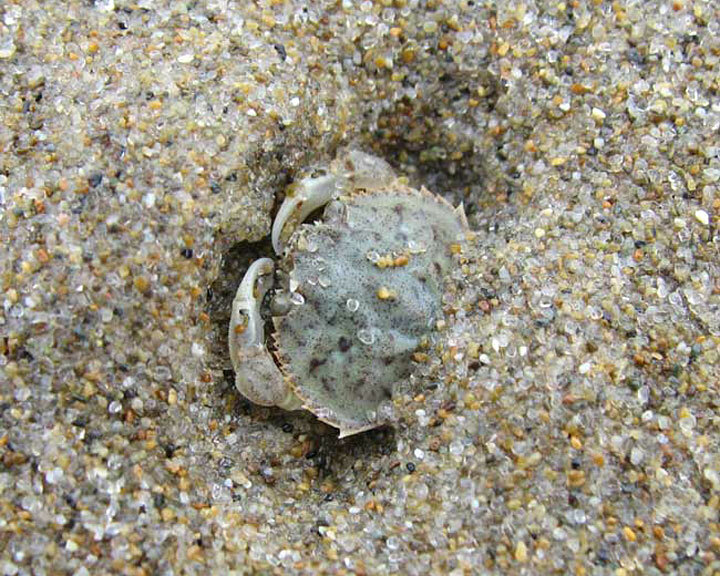 Soon after the live crab has exited (the larger, green crab in adjacent photo) they bury themselves in sand to allow their new shell to harden. 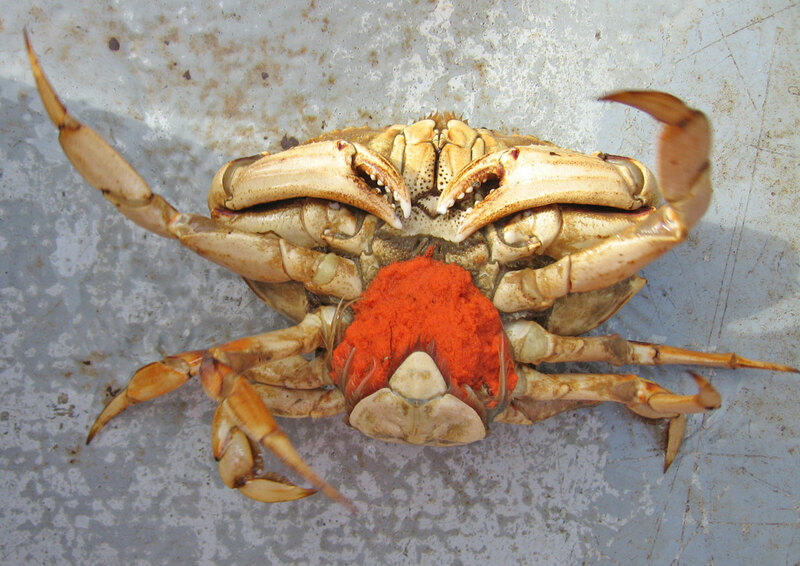 Adult crab populations tend to molt simultaneously, Females in the spring, Males in the late summer. It often produces a scene like this one. Nearly all of these crab are NOT dead, they are molts. Since molting is such a tricky undertaking of physics some percentage of crab will die during the process and turn up among the molts. Observant beachgoers are familiar with crab exuvia, known more commonly as “crab molts”. Determination on whether beached crabs are dead or simply the shell left behind from this process can be made with a quick check at the molt line. Since, the exuvia is very whole, as the crab leaves even its old gills, antennae, and mouthparts behind, this determination usually requires a good look. 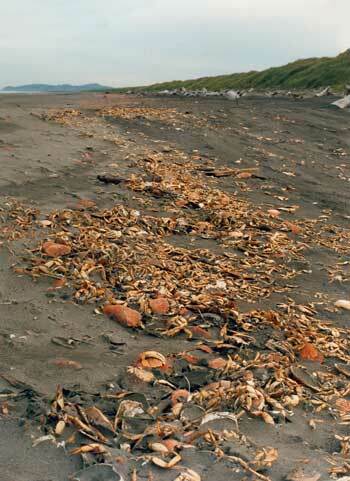 In summer months, when Dungeness crab molting activity peaks, ODFW usually receives calls reporting “many dead crab on the beach” which are almost always these exuvia or “molts”. Adult Dungeness crab forage on a number of fish and invertebrate species. They can be found throughout the sandy and muddy areas in the shallowest parts of lower estuaries all the way to depths of 2,000 feet. 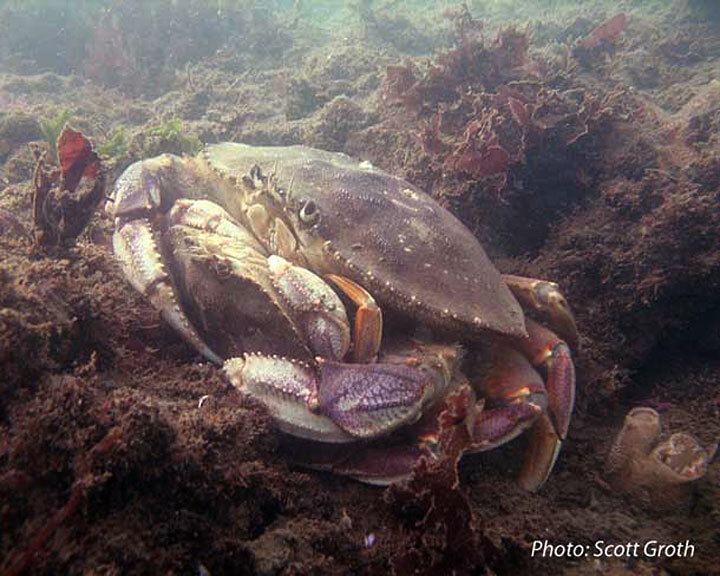 Dungeness crab can only successfully mate when the female is newly molted. For this reason, in early spring, adult male crabs seek female crabs that are likely to molt soon. Crabs will stay in this “pre-mating embrace” until females molt, this can go on as long as two weeks. After females molt, male spermatophores are deposited and the embrace often continues for protection of the newly molted female. 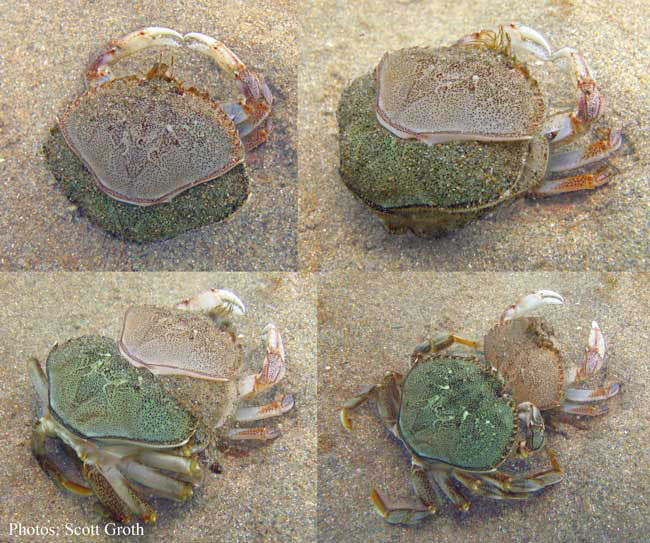 The offset molting cycle is the reason female crab molts appear on Oregon beaches earlier than those of males. In the fall, females begin extruding eggs and fertilizing them with spermatophores stored from spring mating. When first extruded, these eggs are bright orange, this condition is commonly referred to as “berried up”. Females hold the eggs in place with wide abdominal flap equipped with haired pleopods (a feature absent in male Dungeness crab). As the eggs develop and become closer to hatching they turn blackish, at which time they are released into the water to begin the cycle anew.